For a better understanding of the main results obtained in the previous section, an index, ranking the five countries is created. The index is calculated using thirteen questions from the survey which explains the attitude and current situation of fire safety among the five countries studied. All the thirteen questions are broadly divided into four groups: Knowledge, Attitude, Behaviour and Prevention, sample weights also have been incorporated in the study in order to have appropriate representation of all the respondents. Each country is ranked on the basis of score they received out of 100 on the basis of thirteen questions (see Appendix for questions). Finland is ranked at the first spot with 65 points, followed by Estonia with 60 points while Denmark is at the third position with 55 points. Lithuania and Latvia have scored a relatively low score, Lithuania just got 37 out of 100, while Latvia managed to score just 31 and is ranked at the bottom (see Figure 31). In this analysis, we will have a closer look at the performance of different groups based by gender, settlement type, age groups, education level, income level, etc. To test the statistical significance of the results, two different statistical tests are performed, Wilcoxon-Mann-Whitney test or Kruskal Wallis test. Wilcoxon-Mann-Whitney test is a non-parametric analog to the independent samples t-test and can be used when there is no assumption that the dependent variable is a normally distributed interval variable and the Kruskal Wallis test is used when there is one independent variable with two or more levels and an ordinal dependent variable. The result for the test of statistical significance of all the following grouping variables in five countries turned out to be significant which means that there is a statistically significant difference between the underlying distributions, for example for the index based on the gender, when tested the result is statistically significant which means that the index score for males in country A and the index score for females in country A have a statistically significant difference. Figure 32 shows the gender-based index, where two additional indices are created – one for males and another one for females and plotted along with the general index. It can be seen in the figure that scores for males are higher than for females in all five countries. The gender-specific ranking has only a slight variation in comparison with the general ranking except in Estonia. In terms of ranking of males, Estonia is 3 points behind Finland while in general ranking the difference is 5, which is due to the reason that the difference between the score of males and females is the highest in Estonia. Denmark and Lithuania have the least gender-based difference. 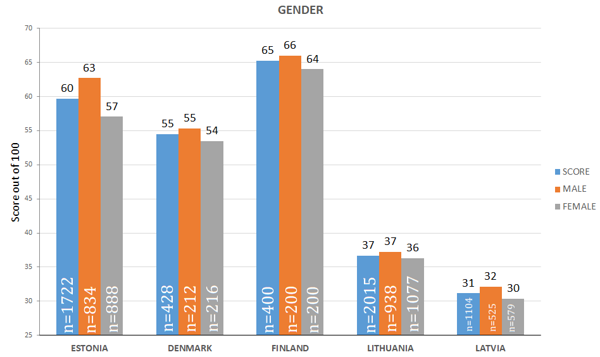 The major reason for the disparity between gender in Estonia is because of differences in the knowledge-related questions about fire safety. For example, when asked about their competence in using the fire extinguisher, only 20% of the Estonian women said they know how to use it while 60% of the Estonian men replied that they know how to use it. In Finland the figure stands at 35 for women and 76 for men, there is also a significant difference in Lithuania and Latvia. In Denmark, it is the opposite case – the proportion of Danish women who can use fire extinguisher exceed the proportion of Danish men. Lack of knowledge can also be seen with regards to the question regarding how long a sleeping person can survive in a fire if the fire broke out in the same room, there is a gap of almost 20% in both Finland and Estonia while Lithuania and Latvia have significant differences and Denmark is again the other way round. When asked “have you or someone else swept the chimneys of your heating system in the last two years?“, only half of the Danish women respondents said “yes“, while the proportion of Danish men respondents stands at 71%. Figure 33 shows the index based on the type of settlement in which the respondent resides. Type of settlement is divided into four groups which are a city, suburb, small town and rural area. It is quite apparent from the figure that the city area in all the countries is doing relatively worse than the general trends, there is a difference of 5 points each in Estonia and Finland. The main reason is the low score in preventive parameters which includes discussions regarding fire safety and sweeping of chimneys, overall in preventive parameters Estonian residents from city scored 18 out of 30 while on general level it is 20 out of 30, the figure in Finland stands at 16 in city and 18 in general out of 30 respectively, in Lithuania 11 in city and 13 in general out of 30 respectively and in Latvia just 8 in city and 11 overall out of 30 respectively. The performance of small towns is also in contrast with the general trends, the reason for this difference in Estonia is due to relatively low scores in the parameters of attitude, behavior and preventive related scores. For example, only 22% in Estonian small-town residents consider fire extinguisher to be important (34% in general), only 55% consider smoke detector to be important (76% in general), only 16% have fire extinguisher at home (33% in general) and only 70% have swept their chimneys in the last two years in comparison with overall figure which is 88%. In Denmark, the low score is caused by the low results in preventive measures. Just 48% of the small towners have swept their chimneys in last two years while on a general level it is 61% and also just 20% of the population have controlled the working condition of the smoke detector while the figure stands for 37% for all respondents. The score of Estonian and Denmark for small town index equals to 53. The suburbs of Estonia and Denmark are doing relatively better than the rest of the country, in Estonia, the score in knowledge and attitude parameters is relatively better than the rest of the country and in Denmark, the score in behavior parameters is better than rest of the country. Rural area in all the four countries (no data for Lithuania) is doing better than the other regions. In Estonia, the index score for the rural area is 65 in contrast with 60 overall. Good performance in all four categories of questions led to this gap of 5 points, 43% and 83% of the rural people thinks that the fire extinguisher and smoke detector is important in comparison with the general level of 34% and 76% respectively. 44% and 45% in rural areas said that they have a fire extinguisher in their home and know how to use it in contrast to 33% and 39% respectively saying the same on a general level. Similarly, a relatively large proportion of people have discussed fire safety and controlled smoke detector in rural areas. In Denmark, 77% of the rural people think fire extinguisher is important in comparison with the general level of just 51%. 69% and 71% in rural areas said that they have a fire extinguisher in their home and know how to use one, respectively, in contrast to 44% and 61% saying the same on a general level. In Finland, the gap is between general score and rural score is 6 points, the main reasons are same for Estonia and Finland but the major contributing factor are the following questions – 66% of rural people think fire extinguisher is important as opposed to just 40% on the general level, 72% have fire extinguisher in rural area in comparison with just 45% in general and 60% rural people said that they had discussion related to fire safety while on general level it is 48% of the respondents. Rural respondents in Latvia are also doing better in attitude and preventive parameters, for example, 34% and 33% of rural Latvians consider fire extinguisher and smoke detector as important respectively as opposed to just 22% and 21% on the general level. Also, 37% of rural people said that they had a discussion related to fire safety while on a general level it is just 28% of the respondents. In Lithuania, there is not much difference in the scores of different types of settlement. Figure 34 shows the index based on different age groups. There are three different age groups – youth, adults and retired people. Retired people are not performing at par with other age groups in Estonia and Denmark, the reason is broadly due to knowledge and behavior related questions. Just 78% and 26% of retired Estonian can recognize the smoke detector alarm and use fire extinguisher respectively with the national average for the same being 84% and 39% respectively. Also, just 10% of retired Estonian are willing to receive information related to fire safety while on a general level the proportion is 15%. In Denmark, only 44% of the retired people answered correctly about the time a person can survive in case of a fire, on a general level it is 56%. Only 48% and 74% of the retired Danish people identified the sound of smoke detector alarm and said that smoke detector is important respectively in contrast with general level with 58% and 82% respectively. Working people of Denmark and Finland are doing better than the general population by two points in both the countries. In Denmark the major factor is the relatively good score in knowledge, behavior and attitude parameters, for example, 94% of the Danish working respondent think that smoke detector is important while on the general level it is just 82%. In Finland, the relatively high score is due to the high score in attitude, behavior and preventive parameters, for example, 55% of the Finnish respondents said that they had a discussion about fire safety in comparison with 48% on the general level. There is no significant difference in the performance of adults in Estonia, Latvia and Lithuania from the general level. Youth in every country except Estonia is doing worse than the general trend. The performance in Estonia is identical with the general one. In Denmark, the reason for low scores is behaviour and preventive parameters, only 67% of Danish youth said that smoke detector is installed in their home in contrast to 81% on the general level. In Finland there is a drop of 6 points to 59 from general score of 65, relatively low score in all the four parameters led to this result, just 46% of Finnish youth answered correctly about the time a sleeping person can survive in case of a fire while on a general level the figure is 61%. 24% and 32% of Finnish youth said fire extinguisher is important and they have it respectively while in general, it is 40% and 45%. Only 4% youth are interested in receiving fire safety information while on general level-12% are interested and just 34% said that they had a discussion about fire safety in comparison with 48% on the general level. The low score in Lithuania can be attributed to knowledge-based parameters while in Latvia it is a mix of knowledge, preventive and behaviour parameters. One important thing to note here is that ranking for the youth is not the same as the general ranking. Estonia takes the top spot and Finland slide down to the second while the rest of the order remains the same. Figure 35 show the index on the basis of nationality, it can be seen that the native population (ethnically Estonian people in Estonia, Latvian people in Latvia and Finnish people in Finland) is doing well in all the three countries, it is important to note that the number of non-native respondents in Denmark is less than 30 so the result is not statistically significant, and this fact is denoted by a star(*) on Denmark non-native index, the same symbology is maintained throughout the report. The report does not focus on the result obtained with an insignificant amount of respondents (n<30) as just a single of outlier can lead to misinterpretation. The non-native in Estonia and Latvia who are primarily ethnic Russian are doing relatively worse off in comparison with the general trend. There is a difference of 11 and 7 points respectively in the index of non-native Estonian and Latvian in comparison with natives. The low score among Estonian non-native is due to the overall poor performance in all the four parameters. Just 42% of non-native Estonian answered correctly about the time a sleeping person can survive in case of a fire while the 52% of native Estonian answered correctly. 22% and 63% of non-natives answered that they think a fire extinguisher and smoke detector is important respectively while natives answered the same with 40% and 82% respectively. When asked if they have a fire extinguisher and smoke detectors at their home, non-native – 18% and 85%, respectively, while natives – 40% and 92%, respectively, and just 51% of non-native said that they had a discussion about fire safety in comparison with 66% natives. 73% of non-natives have swept their chimneys, while 91% of natives swept their chimney. The low score in Latvia is also due to the same reasons. 15% and 13% of non-natives hold the opinion that a fire extinguisher and smoke detector are important respectively while natives answered for the same with 26% and 27% respectively. When asked if they have a fire extinguisher at their home, non-natives – 8% and natives – 17%, respectively, and just 21% of non-native said that they had a discussion about fire safety in comparison with 32% natives and 69% of non-natives have swept their chimneys while 82% of the natives did it. Figure 36 shows the index based on the main language of communication of the respondents. The major difference can be seen between the native (Estonian/Latvian speaker of Estonia and Latvia) and the minority Russian speaker in both of the countries. There is again the difference of 11 and 7 points between the native speaker and non-native speaker in Estonian and Latvia, respectively. The low score among Estonian Russian speaker is due to the overall poor performance in all the four parameters. Just 41% of non-Estonian speakers answered correctly about the time a sleeping person can survive in case of a fire, while 52% of the native Estonian speaker answered it correctly. 76% of non-Estonian speaker recognized the sound of smoke detector alarm while 88% Estonian speaker recognized it. 21% and 63% of non-native speaker said that a fire extinguisher and smoke detector is important, while the native Estonian speaker answered for the same with 40% and 82%. When asked if they have a fire extinguisher and smoke detectors at their home, non-native Estonian speakers – 18% and 85%, respectively, while native speaker – 39% and 92%, respectively, and just 49% of non-native speakers said that they had a discussion about fire safety in comparison with 66% native speaker. Just 73% of the non-native speaker has swept their chimneys, while 91% of the native speaker has done that. The low score in Latvia is also due to almost the same reasons. Just 21% of the Latvian Russian speaker recognized smoke alarm while 31% of Latvian speaker did. 12% and 11% of non-native speaker said that a fire extinguisher and smoke detector is important while the native speaker answered the same with 28% and 28% respectively. When asked if they have a fire extinguisher and smoke detector at their home, nonnative speaker – 8% and 7% respectively, while native speaker – 16% and 11% respectively and just 20% of non-native speaker said that they had a discussion about fire safety in comparison with 32% native speaker. Just 70% of non-native speakers have swept their chimneys while 81% of the native speaker has swept their chimneys. Figure 37 is the index based on the different size of the family, from the first view of the graph it can establish that the respondents who have at least two family members in their household are doing as good as the general level or better. But the significant result is the poor performance of one-member households in all the five countries. One-member family which generally consist of working individuals and retired people has significantly low scores in all the five countries. In Estonia, it can be attributed to the poor performance in knowledge, behavior and preventive parameters. For example, on general level, 39% of Estonian know how to use fire extinguisher while just 28% of one-member households knows. When asked about the importance of fire extinguisher and smoke detector in their home, on a general level the response is 34% and 76% respectively while 1-member family said 22% and 61% respectively. When asked if there is a fire extinguisher and smoke detector in their home, on a general level the response is 33% and 90% respectively while 1-member family said 14% and 83% respectively. Just 44% of 1-member family have controlled the working condition of the smoke detector while the figure stands for 54% for all the respondents. In Denmark, on a general level, 61% of Danish know how to use fire extinguisher while just 51% of 1-member family knows. The proportion of people in Denmark who know the fire emergency number “112“ is 86%, but only 68% 1-member family knows this number. Just 65% of one-member family thinks the smoke detector is important while 86% of the Danish respondents thinks the same. The most crucial part is the preventive parameter where there less frequent discussion regarding fire safety in 1-member Danish family and number of 1-member family who swept the chimney are drastically low in comparison with an average Danish respondent. The Finnish low score is due to poor performance in behaviour and preventative parameters. For example, just 23% of 1-member family has fire extinguisher while in general 45% of Finnish people have it. Similarly, as in Denmark, the most crucial part is the preventive parameter where there is quite a few discussion regarding fire safety in 1-member Finnish family and number of 1-member family who swept the chimney are drastically low in comparison with an average Finnish respondent. Figure 38 shows the index based on the type of dwelling the respondents reside in. The first view of the graph suggests that single-family house is doing quite better than the national average while the dwelling with multiple families is performing poorly (except in Lithuania) in comparison with the single-family house or with general average. Respondents residing in single family house in Estonia are doing well in all the four parameters, for example, 47% of respondents in single family houses in Estonia knows how to use a fire extinguisher opposed to just 39% on average. When asked about the importance of fire extinguisher and smoke detector the national average is just 34% and 76% respectively while the Estonian respondents in single family houses responded with 54% and 87% respectively. 60% of single-family households have fire extinguisher while on a general level it is just 33%. Just 63% of single-family household have controlled the working condition of the smoke detector while the general figure stands for 54% for all the respondents. Single-family houses Finland is also doing exceptionally well, for example, 63% and 74% of the respondent from Finnish single-family houses thinks that fire extinguisher is important, and they have fire extinguisher respectively while on the general level the figure stands at just 40% and 45% respectively. Also, the discussion regarding fire safety took place in 66% of single-family houses opposed to just 48% of houses in general. Single-family houses in Latvia is doing quite well, this is the highest index point (38) Latvia scored among all the sub-indices. The main factors are when asked about the importance of fire extinguisher and smoke detector the national average is just 22% and 21% respectively while single-family households responded with 36% and 30% respectively. 30% and 17% of single-family houses have a fire extinguisher and smoke detector installed while on a general level it just 13% and 9%, respectively. The proportion of chimney which was swept – 88% in the last two years and controlled the working condition of smoke detector – 11% in the single-family household but on a general level, the figure is 78% and just 4% respectively. Also, the discussion regarding fire safety took place in 40% of single-family houses opposed to just 28% of houses in general. In semi-detached houses with less than 8 apartments, Denmark has scored quite a low score. The major reason that only 40% of people in apartment know how to use a fire extinguisher compared to the national average of 61%. 41% and 34% of people in semi-detached apartment believe that fire extinguisher is important and have it respectively while on a general level it is 51% and 44% respectively. Also, 68% and 60% people in apartment think smoke detector is important and have it installed respectively while on a general level it is 82% and 81% respectively. 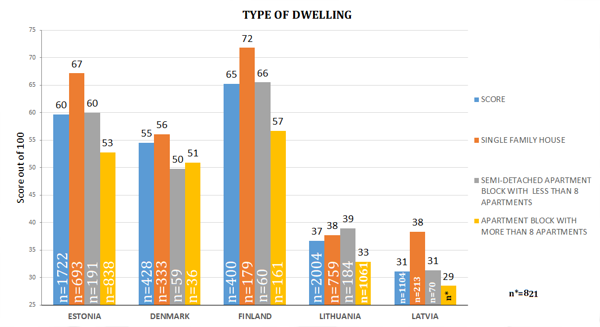 In contrast, Lithuania is actually doing better in semi-detached apartments largely due to the fact that 46% of the respondents in the apartment have a smoke detector in comparison with just 31% on the national level. In apartments blocks with more than 8 apartments, every country is performing poorly. In Estonia, the proportion of people in this apartment who thinks that fire extinguisher is important and have it, is 19% and 14% respectively compared to 34% and 33% on general level. Also just 67% of apartment blocks respondents have swept their chimneys while on a national level 88% of Estonian respondents did. The reason in Denmark is as follows, just 64% of apartment people know the fire emergency number while on a general level it is 86%. Also, just 1% of the people in apartment blocks in Denmark are interested in receiving information regarding fire safety and just 17% had a discussion regarding fire safety in an apartment opposed to an average of 37% nationally. In Finland the proportion of people in apartment blocks who thinks that fire extinguisher is important and have it, is 16% each, respectively compared to 40% and 45%, respectively, on a general level. Also, just 74% of apartment folks have swept their chimneys while on national level 89% Finnish swept their chimneys. Just 32% had a discussion regarding fire safety in an apartment in oppose to an average of 48% nationally. In both Lithuania and Latvia, the score is low in these apartment block largely because a fewer number of people swept their chimneys. Figure 39 depicts the index based on the employment status of the respondents. As almost half of the respondents in every country is a wage worker, so there is no very significant divergence from the general level of the index. Except for Estonia in all four countries, self-employed respondents have performed better than the national average. In Finland, the score reached 75, which is the highest score achieved throughout the study by any country in any group. Self-employed people in Finland have scored comparatively better. 63% and 65% of self-employed Finnish respondents have said that fire extinguisher is important and also have it at their home respectively opposed to 40% and 45% on a general level. The discussion regarding fire safety took place in 84% of self-employed households compared to just 48% of households in general. 97% of self-employed people swept their chimney in last two year while on a general level it is just 89%. 61% of self-employed respondents have controlled the working condition of the smoke detector while the figure stands for 46% for all the Finnish respondents. Latvian self-employed respondents also did quite well. 49% of self-employed correctly recognized the sound of a fire detector alarm compared to just 27% on the general level. Also, 89% of self-employed respondent knew the correct fire emergency contact details in comparison to just 75% overall. But the major difference is in behavior parameter where 27% and 18% have a fire extinguisher at their home and smoke detector installed respectively in oppose to just 13% and 9% overall. 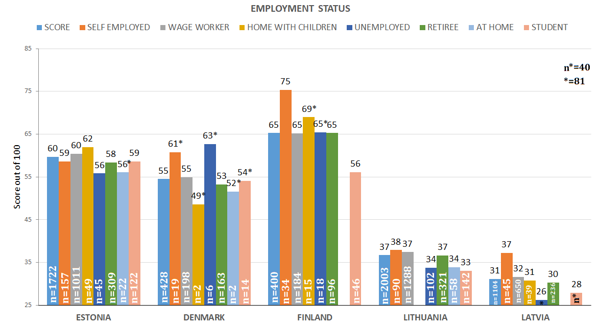 Unemployed respondents in Estonia have a low score because of their response to two major drawbacks which are – more smoking is done indoors and less discussion about fire safety in the households. A retiree in Estonia have scored two points less because of the relatively lower score in every four parameters but retirees in Denmark have failed to recognize the sound of smoke detector significantly and also tend to undermine the importance of smoke detector. Students in Estonia, Denmark, and Lithuania have performed at par with the general trend but there is a significant gap in Finland and Latvia. In Finland, just 48% of the student answered correctly about the time a sleeping person can survive in case of a fire while on a general level it is 61%. 24% and 27% of Finnish student think fire extinguisher is important and have it at their home respectively while on a general level it is 40% and 45%. Just 22% of Finnish student had a discussion regarding fire safety in an in oppose to an average of 48% generally. Just 21% of Finnish respondents have controlled the working condition of the smoke detector while the figure stands for 46% for all the Finnish respondents. Latvian student also scored quite low. Just 13% of the students answered correctly about the time a sleeping person can survive in case of a fire while on a general level it is 30%. Just 10% of the students know how to use a fire extinguisher while the national average is 26%. Just 57% of students swept their chimney in comparison to 78% nationally and lastly not even a single Latvian student controlled the working condition of the smoke detector while the figure stands for 4% for all the Latvian respondents in general. Figure 40 depicts the index based on education level, respondents with high school or vocational education are at par with the general level of the index. Respondents with elementary education have a relatively low score in Estonia and a relatively high score in Finland. 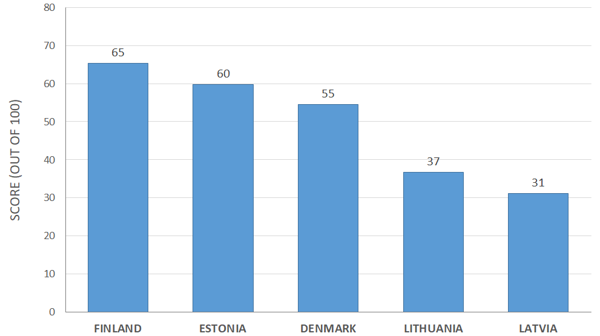 The relatively low score in Estonia can be explained with poor performance in knowledge and behaviour parameters and the high score in Finland can be solely attributed to the preventive parameters, for example, 52% of Finnish respondents with elementary education had a discussion regarding fire safety opposed to average of just 48% nationally; and 57% of Finnish respondents with elementary education controlled the working condition of their smoke detector in comparison with just 46% on a general level. Respondents with a basic education in Denmark and Latvia have lower scores. In Latvia, just 20% of the respondents with basic education recognized the sound of a smoke detector alarm while 27% recognized it on the national level. 8% and 3% of Latvian respondents with basic education have a fire extinguisher and smoke detector installed in their home respectively in comparison to 13% and 9% on a general level respectively. Just 21% of Latvian respondents with basic education had a discussion regarding fire safety while the national average is 28%. Also, a number of Latvian respondents with basic education tend to smoke more inside the house. In case of Denmark, just 60% of Danish respondents with basic education have a smoke detector installed in their home opposed to 81% in general and also higher number of Danish respondents with basic education tends to smoke indoors. 12% of Danish respondents with basic education get their chimney swept by a professional in while on a general level it is 37%. 12% of Danish respondents with basic education have controlled the working condition of the smoke detector while the figure stands at 27% for all the Danish respondents. 61% of self-employed respondents have controlled the working condition of the smoke detector while the figure stands for 46% for all the Finnish respondents. 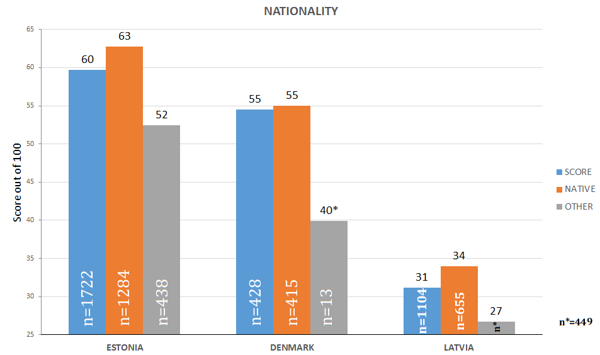 For the respondents with higher education, the score is more than the general level in Denmark, Lithuania, and Latvia while lower in Estonia and Finland. In Estonia, the reason is simply the proportion of respondents who have controlled the working condition of the smoke detector, which is 48% in comparison to the general level of 54%. In Finland, the first reason is the same as Estonia, where Finnish respondents with higher education who controlled the working condition of their smoke detector is 38% opposed to the general level of 46% and just 49% of Finnish respondent with higher education knows how to use a fire extinguisher opposed to 56% in general. Danish respondents with higher education have scored very well, for example, 91% of Danish respondents with higher education have smoke detector installed in their home opposed to 81% in general and 87% of Danish respondents with higher education do nots smoke indoors while the national average is 76%. 47% of Danish respondents with higher education had a discussion regarding fire safety while the national average is 37% and 74% of Danish respondents with higher education swept their chimneys while on average just 61% of Danes did it. In Lithuania, 39% of Lithuanian respondents with higher education have a smoke detector installed in their home in comparison to just 31% in general and 68% of Lithuanian respondent with higher education do not smoke indoors while the national average is 56%. Also, 54% of Lithuanian respondents with higher education can recognize the sound of smoke detector alarm opposed to 49% on the general level. In Latvia, 26% and 14% of the respondent with higher education said that smoke detector is important, and have it installed, respectively, in comparison to just 21% and 9%, respectively. 73% of Latvian respondents with higher education do not smoke indoors while the national average is just 59%. Figure 41 shows the index calculated on the basis of different income levels. There are five income levels (level 5 is the highest income, Lithuania just have 4 level with level 4 being the highest), there are also people who refused to answer this question or did not disclose their income level. Estonia is the country with least variation on the score of different income level respondents, while Finland shows a positive relationship between income level and score, as the income increases the score increases in the range of 54 to 72. The number of respondents in Denmark with the income level of 1, 2, 3 and 4 are very insignificant so the result plotted on the figure is statistically insignificant. Lithuania and Latvia show a zig-zag pattern. In Finland, the score for respondents with level-1 income is quite low and it is due to the poor performance in all the four parameters, for example, the proportion of level-1 income Finnish respondents who can use a fire extinguisher is just 39% opposed to 56% in general. 26% and 25% is the proportion of level-1 income Finnish respondents, who said that a fire extinguisher is important and have it available at their home in comparison to the general average of 40% and 45%, respectively. But the parameter where level-1 income Finnish respondent performed miserably is prevention, just 16% of level-1 income Finnish respondent had a discussion about fire safety in comparison with 48% overall. 78% of level-1 income Finnish respondent swept their chimney and 28% controlled the working condition of the smoke detector while for the same the general level is 89% and 46% respectively. Latvian level-1 income respondent also performed badly in behavior parameter, for example, not a single respondent has a fire extinguisher in their home. The ranking for respondents with level-1 income changes, Estonia takes the first spot replacing Finland. Level-2 Income Finnish respondents did better than the one with level-1 income nonetheless, it is less than the Finnish average. Level-2 Income Lithuanian respondents perform worse than the one with level-1 income group, for example, just 25% of them have a smoke detector installed as opposed to the national average of 31%. The score of level-4 income level Finnish, Lithuanian and Latvian respondents improved because of their better performance in behaviour and preventive parameters, for example, 100% of level 4 Income Finnish respondents have a smoke detector installed and do not smoke indoor opposed to 98% and 99%, respectively. Also, 57% have a fire extinguisher in their home in comparison to just 44% on the general level. 68% had a discussion related to fire safety and 92% controlled the working condition of the smoke detector while the general average is just 48% and 46% respectively. 38% of Lithuanian level-4 Income respondent have a smoke detector installed and 67% controlled the working order of their smoke detector in comparison to the general average of 31% and just 15% respectively. In Latvia, 87% of level-4 income level respondents have controlled the working order of the smoke detector compared to the general average of a meagre 4%. As explained above the score of level-5 Finnish respondents is more than level-4 Finnish respondents and in Latvia, the score of level 5 income respondents remains almost the same as level 4 but now with a considerable good score in behavioral parameters. Figure 42 shows the index on the basis of the presence of a kid aged between 5-15 years in the household. It is noticeable, that the households with children aged between 5-15 years old are scoring better in all five countries. As the proportion of family who has a child ranges from 20% in Finland to 33% in Estonia, the impact of the average score is not that much but the individual score of a household with children is quite high. In Estonia, the index score for a family with a child is 64 in oppose to 60 in general and 58 for a household without a child aged 5-15. The factor affecting these results is the combination of the relatively good score in all the four parameters of knowledge, behavior, attitude, and prevention. For example, 53% of the respondents with child correctly answered the time a sleeping man can survive in case of a fire while 47% of the respondents without a child answered correctly and 42% of respondents with a child knows how to use fire extinguisher while for respondents without a child it is just 38%. In terms of attitude, 40% and 83% of Estonian respondents with child responded that fire extinguisher and smoke detector is important respectively while the respondents with a child said 31% and 73% for the same, respectively. Also, 18% of the respondents with the child are interested in receiving information regarding fire safety opposed to just 14% of Estonian respondents without a child. 73% and 58% of the Estonian respondents with the child have discussed the fire safety in their household and have controlled the working condition of smoke detector respectively while the respondents without child did the same with just 56% and 53% respectively. 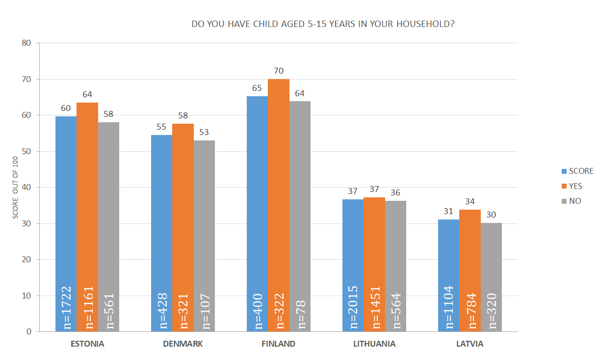 In Denmark, there is a gap of 5 points between the respondents with child and without a child. Similarly, as in Estonia, the difference is due to overall relatively good performance in all four parameters. For example, 66% of the respondents with a child correctly answered the time a sleeping man can survive in case of a fire while 52% of the respondents without a child answered correctly and 67% of the respondents with child can recognise the sound of a smoke detector alarm opposed to just 54% of the respondents without child aged 5-15. 54% and 85% of Danish respondents with child responded that a fire extinguisher and smoke detector is important respectively while the respondents with a child said 50% and 80% for the same respectively. Also, 82% of the Danish respondent with a child said that there is no smoker in the household while for the same question respondents without a child said 74%. 67% of the Danish respondents with the child have swept their chimney opposed to just 57% of the respondents without child aged 5-15. In Finland the score for Finnish with a child is 70 while for the respondents without a child it is just 64. Similarly, as Estonia and Denmark, the disparity is due to the good performance in all the four parameters. For example, 64% of Finnish respondents with a child knows how to use a fire extinguisher while just 54% of Finnish respondent without a child is competent in using a fire extinguisher. 47% and 58% of respondents with child thinks that fire extinguisher and have one at their home respectively in oppose to just 39% and 42% respectively by Finnish respondents without a child. 77% and 93% of Finnish respondents with child had a discussion regarding fire safety in their home and swept their chimney respectively while on the other hand, the number for Finnish respondents without child stands at just 41% and 87% respectively. There is just a difference of 1 index point between Lithuanian families with a child or without one. In Latvia, the difference of 4 points emerges from all the four parameters. For example, 82% of the Latvian respondents with a child knows which number to call in case of a fire, while just 72% of the Latvian respondents without a child knows which number to call. 25% of respondents with the child are interested in receiving more safety information while it just 19% for Latvian without a child. Also, 34% of Latvian respondents with child had a discussion in their home about the fire safety while just 25% of the Latvian respondents without a child had a discussion regarding fire safety in their household.